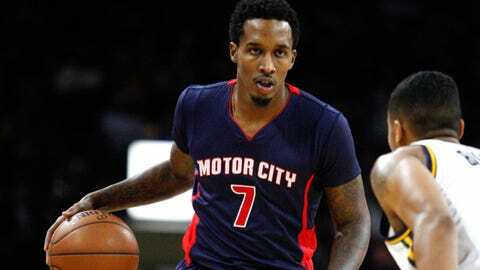 It may be a while before Brandon Jennings is back on the floor for Detroit. Detroit Pistons point guard Brandon Jennings won't be ready to start the season after tearing his Achilles in January last season. Jennings had originally hoped to be back within a 6-9 month timeframe, but that doesn't appear likely to happen. Jennings has yet to appear in any preseason games for the Pistons. “I don't know exactly the timetable when he'll try to make live moves against defenses and stuff, but he's up to doing almost everything,” Van Gundy said. Jennings gave a 6-to-9 month timetable at the time of his injury. He will miss that deadline, but Van Gundy thinks a return around Christmas is reasonable. “They've given us sort of Christmastime, sort of tentative, very general, though, before or after so I think there's a reasonable chance he could play in a game before the first of the year,” Van Gundy said.